and a couple things that bother me are that when I click on a name in the database, it does not always come up at the bottom left as to the relationship of the person selected with the root person. You seem to have to go to the set relationship thing and redo it all the time and even then it doesn't seem to work real well or for long. Also, it should also show relationship by marriage, so it might say "wife of 2nd cousin once removed" or something. Otherwise you are left to do a bunch of happy horse crap to figure out how this person is related. Another thing that I don't like is the whole light bulb thing. If you go to a screen that has only one light bulb, or a few or even none or whatever, you have to just sit there and wait and see IF a light bulb shows up??? How long are you supposed to wait, a minute, 5 minutes, all day, what? Another thing that is unhandy is when you have a name with no facts yet, and you want to add birth and death info, you have to do it one at a time by add a fact, search b, click on birth add that info, save it. Then add a fact, search d, click on death...etc. Why not just be able to just click on something like "add birth/death info" since that is the most common info. My other hang up is not only with this program but with some others like it. I don't want LDS Mormon stuff in my program. I don't believe LDS/Mormon stuff, I think their religion is a false one and a cult, and I really don't want it intertwined in my program. You should be able to nuke all that stuff or better yet, only add it to your program if you want it. Maybe that's "bigoted" but it is what it is. And the fact that I cannot delete "built in" facts I don't need and will never use and don't want to see at all just makes it worse. Set Relationship isn't automatic when you add new individuals to the database. That is why you need to run it again. On the WebHints are you thinking of something to show it did look for the WebHints and found none? I don't think we have that as a suggestion on our enhancement list yet. Right now we just have to wait for the providers API to report back if something was found. You can uncheck LDS Options under Tools>File Options>General. That doesn't prevent the import of LDS facts if you receive it from another source. If you have them in your database you can strip them out with a drag n drop. 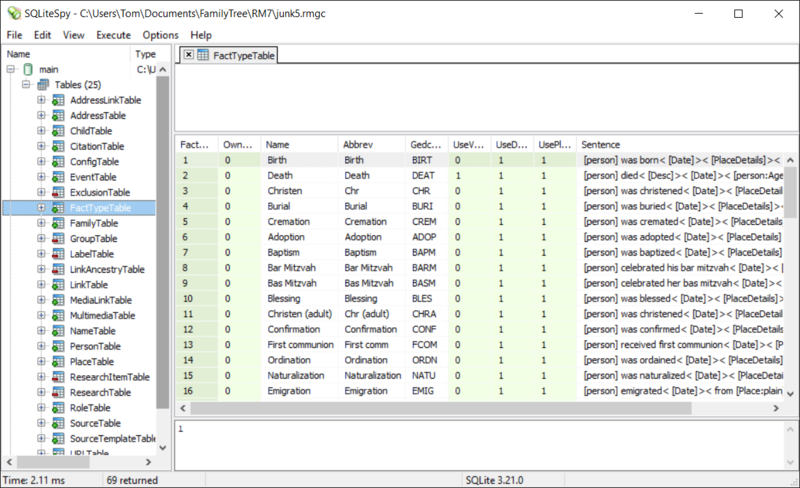 Go to Lists>Fact Type List and edit each LDS fact so it's not included in GEDCOM. Not automatic is probably why I see it happening then. The web hints thing is frustrating only because you don't know how long is long enough to wait. It isn't just the lds stuff, something like "Bar Mitzvah" or whatever, don't need it, don't want it to even show up in the add fact thing. A large amount of information that you use to enable you to enjoy the fruit of your labor are largely supplied by the efforts of members of the Latter Day Saints. As far as Jewish FACTS, all people groups are interested in their family history. The Jewish nation has kept genealogy records for over 6,000 years. And because of their efforts, LDS and Jewish peoples, you have the information you use to create your family history. Reminds me of a story Abe told: "When Henry was hungry, his wife fixed him food. According to Henry, it was always cold, didn't taste right, didn't look right and complained on and on. But he never missed a meal." OH! by the way Happy Hanukkah! Again, I don't care if people want that stuff in their program, I just don't want most of it in mine. So why not make the program have the ability to include it for those that want it and not include it for people who do not. A good example, every time I need to add a birth fact, I click add a fact, "b", and instead of birth it comes up first with "baptism". I don't give a hoot about when someone was baptized. The next two are "bar mitzah" and "bas mitzvah". Again, I could not care any less. Don't care, don't want to see them, want them gone but the program won't let me delete them. Try typing "bi" in quick succession when selecting a fact type. You can delete selected standard fact types from a database using a SQLite manager on the database's FactTypeTable to delete their records. SQLite is the database engine incorporated in RootsMagic 4-7 that creates and interacts with the RootsMagic database files. There are a number of free and fee-based SQLite managers that can interact directly with RM databases. Here is a screenshot of SQLiteSpy viewing the FactTypeTable of the "junk5.rmgc" database file, any record of which it can delete or modify (at your risk). What happens if you delete stuff out of there and then someone else opens your file in a program that still has the stuff in it? Ok, why is pedigree chart limited to 6 generations? A pedigree chart is not limited to 6 generations. You may be referring to Pedigree View on the main RM screen. It has a 5 generation mode and a 6 generation mode. I leave it at 5 generations most of the time because the screen is too scrunched up in 6 generation mode. I can't imagine that the screen would be usable at all with more than 6 generations unless I had an extremely large screen. I'm not sure what you are asking. Your RM database is stored locally on your computer's hard disk. Nobody else can open it. Assuming this is a followup to using SQLite to delete unwanted built-in fact types from a RM database file, no matter who opens it or a copy of it with RM on any computer, those deleted fact types are no longer available. They cannot be added back in using RM; SQLite can put them back. Using RM to drag'n'drop everyone in this pruned database to a new one will result in a database with the full set of built-in fact types. Another thing that is unhandy is when you have a name with no facts yet, and you want to add birth and death info, you have to do it one at a time by add a fact, search b, click on birth add that info, save it. Then add a fact, search d, click on death...etc. Why not just be able to just click on something like "add birth/death info" since that is the most common info. brings up an entry form screen (called Add Person) with just about what you're wanting & you can click the <Customize this form> link in the lower left of the window to add/remove to/from ...what you'd like the default to be. I find the Add Person screen not to be very helpful because it doesn't allow full entry of things like notes, the description field, sources, and media. Therefore, I enter the bare minimum of information into the Add Person screen to get the person into the RM database. Thereafter, I work primarily in the Edit Person screen for the person. I do think the Edit Person screen has too much modal operation and drill down. No, if I click REPORTS and choose PEDIGREE CHART it is limited to 4,5, or 6. How do I generate a report with more generations? That is the number of generations per page. You can set the report to print up to 30 generations, cascaded across as many 4, 5 or 6-gen pages as is needed. Read the Help system topic "Pedigree Charts" for details. Got it. Thanks. 105 pages long without indexes is the shortest it makes.